Today we chat with soprano Julianne Gearhart, a former Seattle Opera Young Artist and our Amour in Orphée et Eurydice. As the god of love, Gearhart gives a happy ending to this usually tragic Greek myth, so we ask her what motivates her character—and what it's like to ride a shiny golden bicycle on stage. Orphée et Eurydice opened on Saturday, and runs for five more performances through March 10. For more info, visit our website, and keep checking in on the blog this week for more Q&As with our artists! 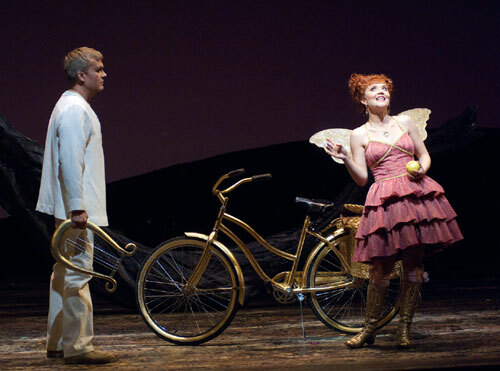 Julianne, audiences at Orphée et Eurydice will certainly remember you from your unique entrance: riding a golden bicycle. What’s it like to ride a bike on stage? You have to get really used to how far you have to ride and how long you have to get there so you can time it. There was a moment in rehearsal where I didn’t stop quite as fast as I was hoping to stop and I panicked that I was going to run into the soprano. It would be really bad if I run somebody over on stage! So there are things that can go wrong, but it’s cute and I think it’ll be really fun and effective and a good pun. I think director Jose Maria Condemi’s pun about the deus ex machina on the bicycle is hilarious—because I get my little machina. William Burden (Orphée) and Julianne Gearhart (Amour) in Seattle Opera's production of Orphée et Eurydice. What are other unusual modes of transportation you’ve had on stage? Well, I think the craziest one was here, in Ariadne auf Naxos in 2004. We had a custom-made grand piano as long as this room—30 feet or so—and put a sail on it and sailed it onto the stage. 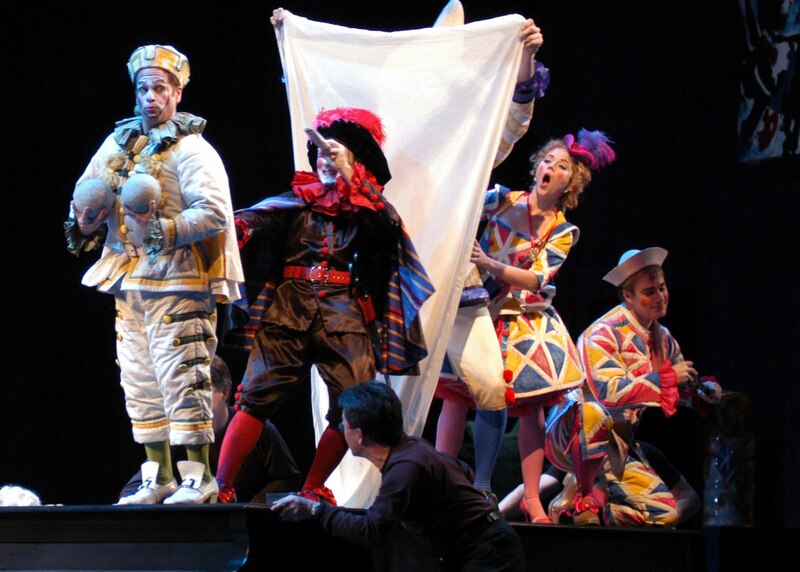 The comics land on Naxos in the 2004 Ariadne: William Saetre (Brighella), Steven Goldstein (Scaramuccio), Seth Malkin (Truffaldino, holding up sail), Julianne Gearhart (Zerbinetta), and Philip Cutlip (Harlekin). But I don’t think I’ve had too many crazy entrances. Maybe getting carried on by men, or that sort of thing. Or flying, or being in a hot air balloon. I’ve never actually taken a live animal, though, and that would be fun. I’ve never gotten to do anything that elegant. This is a very serious opera but your character tends to bring a brighter attitude onto the stage. How do you expect that to play out with audiences? There’s an insouciance about Amour and the way she comes across, and I think it’s fun for the audience—but it’s very serious for the people on stage. 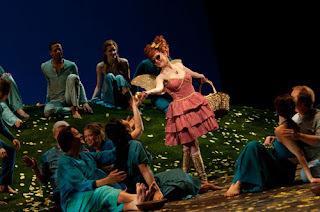 Julianne Gearhart (Amour) in Seattle Opera's production of Orphée et Eurydice. So, why do you think Amour commands Orphée not to look at Eurydice? I think it’s just the message she was sent with. I don’t think it necessarily means anything to Amour. In rehearsal, we talked a little about the meaning of that order, because it’s translated from French as “silence.” It’s not only not looking at her; it’s not explaining the situation. When Amour makes a big deal about it, she’s telling Orphée to keep the silence and submit to the discipline. But I’m not sure there’s a reason why that’s chosen. Julianne Gearhart (Amour) with the Seattle Opera Chorus (as Blessed Spirits) in Orphée et Eurydice. One of your first roles at Seattle Opera was Musetta in the Young Artists Program production of La bohème. But generally you don’t sing a lot of Puccini, do you? Yeah, I definitely don’t even sing a lot of Italian opera anymore. As you progress in your career, you find some specialties—and, actually, now is a really nice time for me to be doing something like Orphée et Eurydice, because I like early music but haven’t had many chances to go back to it. I did some Monteverdi last year and that was my first chance. This is an exciting opportunity because I have been mostly doing late 19th century and 20th century German stuff, so this is like a new world that’s opening up.